Bitcoin enthusiasts appear to have located the wallet number of the federally controlled account that now contains over $3.5 million worth of the digital currency. That money is believed to have come from the seized accounts of the Silk Road website. account holder comes forward to say that they own a particular wallet, it is almost impossible to know with complete certainty who actually controls it. The United States is further authorized to seize any and all Bitcoins contained in wallet files residing on silk road servers, including those servers enumerated in the caption of this complaint, pending the outcome of this civil proceeding, by transferring the full account balance in each silk road wallet to a public Bitcoin address controlled by the United States. As of this writing, the account holds 27,365.87749559 BTC. Kelly Langmesser, an FBI spokesperson, told Ars on Thursday that the agency had seized “more than 26,000, estimated between $3.8 to $4 million,” as part of the Silk Road case. She also noted that this was the first-ever seizure of bitcoins by the FBI. However, Langmesser wrote to Ars on Friday saying that she was “not able to confirm” that this particular account that had drew so much attention on Blockchain.info was a federally controlled Bitcoin wallet. “We are not confirming one account over another,” she added. “The reported amount the FBI stole from Silk Road matches the approximate time and amount held in that address,” he added. 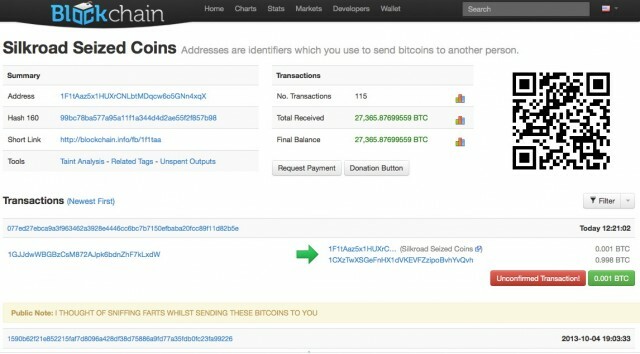 The first transaction to that account was 47 different wallets transferring a total of 1,000 bitcoins on October 2, 2013 at 10:12:18 Greenwich Mean Time, or 6:12:18 Eastern Time, approximately 15 hours after the Silk Road suspect, Ross Ulbricht, was arrested in San Francisco. More transactions after that follow.